I’ve been working on this in my head for a while. 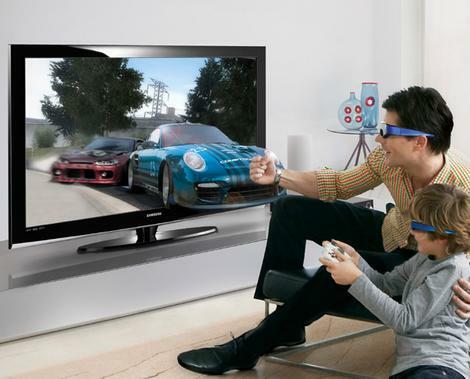 You can’t fail to’ve noticed that whether we like it or not, display manufacturers see 3D as a way to get us to all upgrade TVs, consoles, etc over the next few years. No doubt there’ll be many ways of creating these experiences with or without glasses or holograms perhaps? So, the obvious thing is people will at some point turn to the web and wonder how we can spread 3D magic all over it. I kind of shudder when I think of the 3D environments people thought we might use for e-commerce 10 years or so ago – literally walking aisles selecting products. To me 3D isn’t about recreating real objects, there are opportunities in looking at depth of field, for example. While we have 3D transforms in CSS3, I think there’s a lot of scope for looking at layers and how sharp elements are. That kind of opens us up in other, more simple to achieve ways, which can also be abused! Think of panes of content layered, how the one you’re on at the moment is in sharp focus and the panes behind peep over just a little, each in softer focus than the last. The navigation allows us to navigate the 3rd dimension bringing content forward and back. That example in itself might not be ideal for many sites but you can imagine how discounting the pseudo 3D effects we can create, having a 3rd dimension might be interesting to experiment with. Of course, this also harks to the broader issue of how displays are evolving, which we should never take out eye off. Whether or not Google TV takes off or which variation of 3D experience eventually makes it to be a de-facto standard in most of our homes over time, devices like the 3DS or LG Optimus 3D show the variety of options people will have to browse the web. Incidentally, while doing research for this I’d found this fine post about the 3DS browser and it seems people are starting to talk about this. I remember when considering your default screen resolution was enough (oooh… 800*600 or 1024*768…?) but in terms of desktops, we have a massive range of resolutions and ratios (so where’s ‘the fold’, eh?). We could start making sites available for mobile devices through WAP, some early WebTV project tried to gain traction. We’re now at the stage where we need to think far more broadly of the range of displays people could use and how we feel about how those screens present our work. With digital TVs in the fore, we have higher resolution displays more like a desktop monitor (often far better) to play with. How about interactions? While TV or using a games console might not be a major slice of your audience, it’s worth considering how a user actually navigates a website with one. Is it with a stylus, a Wii style controller, or as I did for a few months use the web only through my PS3? We’re finding patterns for interfaces on touch devices such as large hit areas for fingers on links and the lack of hover state to communicate feedback to the user. For better or worse many of Apple’s design patterns are becoming prevalent as other OS manufacturers ‘substantially borrow’ from what they achieved through the iPhone. With TV and in particular 3D TV, will we ever use web content to any meaningful level? Will be it be in a very different capacity? How would we best interact with it? Sometimes it’ll be appropriate to create a different experience (if you have a graphic heavy site, a differently structured mobile site might be a good idea), hopefully most of the time, we can find techniques to find a appropriate presentation for as wide a range of displays as possible. How would your site work on a monochrome eInk style display? Part of it is that use of displays and what is unique and interesting about them isn’t immediately apparent, which is why having one eye on this field help us to keep a broad understanding of what may come but also that, whatever happens, change is all around us. Great article. Might have heard it before, but succes cannot be said often enough. This is very interesting article.i commend you on your great content and excellent topic choices. 3D isn’t about recreating real objects. very nice article with great content. articles. I’llbookmark your weblog and check agqin here regularly. not, no worries just let me know and I’ll delete it. delete it. Either way keep up the good work. it on my Facebook, if not, no issues just let me know and I’ll delete it. Facebook, if not, no issues just tell me and I’ll remove it. as I found it for him smile So let me rephrase that: Thank you for lunch! and I’ll delete it. Regardless keep up the good work. Hey great post. I hope it’s alright that I shared this on my Twitter, if not, no issues just let me know and I’ll remove it. it on my Facebook, if not, no issues just tell me and I’ll delete it. Hey nice post. I hope it’s alright that I shared it on my Facebook, if not, no problem just let me know and I’ll remove it. me know and I’ll delete it. Regardless keep up the great work.